Advanced superconducting technology is at the core of the FCC study. 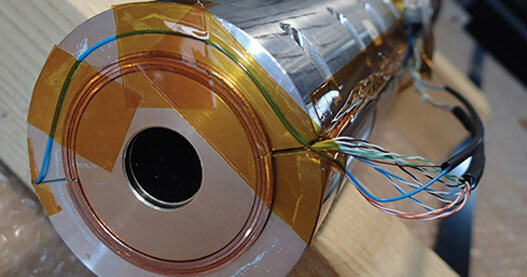 Two of the major technological challenges for an energy-frontier machine are the development of more powerful dipole magnets (16 T, which is around twice that of the LHC) and a new generation of superconductors able to meet the FCC requirements. CERN has launched a 16 T magnet programme, in coordination with a US programme targeting 15 T, and an ambitious FCC conductor development programme with research institutes and industry distributed around the world (CERN Courier May 2018 p40). Niobium-tin (Nb3Sn) is the workhorse of the FCC magnet development programme. The first breakthrough results of this effort came in 2015, when a Nb3Sn magnet in Racetrack Model Coil (RMC) configuration reached a field of 16.2 T (CERN Courier November 2015 p8). The next goal is to create an enhanced RMC (ERMC) reaching a mid-plane field of 16 T with a 10% margin at a temperature of 4.2 K. The first ERMC coil was successfully wound at CERN in April this year (figure 2, left picture) and a demonstrator unit will be available by the end of the summer. The high-field magnets of the proposed FCC-hh collider would require 7000–9000 tonnes of Nb3Sn superconducting wire, with major implications for the superconductivity industry, while boosting the applications of this technology in domains outside high-energy physics. The FCC conductor development programme aims, over an initial four-year period, to meet the challenging requirements of the FCC high-field magnets. The first results are very promising: within only one year, the Nb3Sn superconducting wires produced by various international partners have achieved the same performance as the HL-LHC wire (figure 3), and there are strong indicators that it will be feasible to meet the even more ambitious wire targets (in terms of performance and cost) for FCC. The FCC magnet development programme will require six tonnes of superconducting wire over the next five years for the construction of R&D and model magnets, representing a substantial opportunity for wire manufacturers in Europe and beyond. CERN has also launched a Marie-Curie training network called EASITrain to advance our knowledge on superconducting materials and take into account large-scale industrialisation (CERN Courier September 2017 p31). Another key technology for FCC is advanced superconducting radio-frequency (RF) cavities. 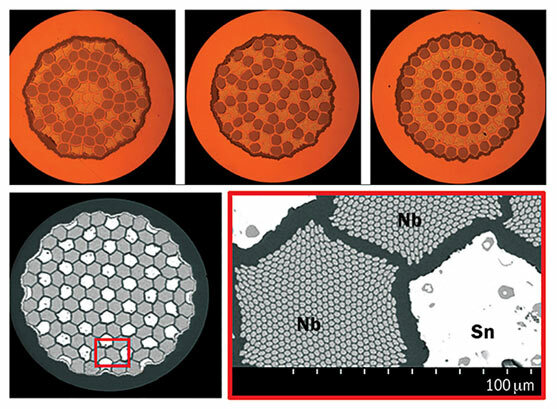 A series of cavity designs comprising single-cell, four-cell 400 MHz and five-cell 800 MHz cavities are being developed, in collaboration with LNL-INFN in Italy and JLAB in the US, to cover the different operation energies foreseen for FCC-ee (figure 4). Recent progress in superconducting RF cavities at CERN has been fascinating, and a concrete R&D programme is under way (CERN Courier April 2018 p26). The technology of superconducting niobium-coated copper cavities, already employed at LEP and LHC, is rapidly advancing, achieving, for FCC-ee, a performance at 4.5 K that is competitive to niobium radiofrequency cavities at 2 K.
Current results from niobium-copper cavities installed in HIE-ISOLDE demonstrate the outstanding performance of this technology, achieving peak surface fields of 60 MV/m. Another key development is the rapid shaping of cavities using novel Electro-Hydraulic Forming, a technique developed in collaboration with the France-headquartered firm Bmax, and promising results from sputtering tests with Nb3Sn films for even more efficient RF cavities. In addition, new klystron bunching technologies that can increase RF power production efficiency up to 90% (compared to the present average of 65%) are being developed in collaboration with the CLIC team. Finally, prototypes of the low-field low-power (and low-cost) twin-aperture dipole and quadrupole magnets for the FCC-ee arcs have been built and tested at CERN. All in all, the new challenges of the FCC compared to the LHC and LEP call for a number of novel, special technologies that will allow a reliable and sustainable operation. New extraction systems, kickers and collimators to control the beam, powerful vacuum systems and novel approaches to deal with beam effects at the new regime of FCC, are but a few examples. These efforts have already resulted in a new beam-screen design (figure 5) to cope with the high synchrotron radiation of energetic proton beams, the first prototypes of which are currently under test at the Karlsruhe Research Accelerator (KARA) in Germany. Among other first pieces of hardware paving the way for FCC are the first prototypes of a superconducting shield septum magnet (figure 6) and an innovative method of laser surface treatment to suppress the electron clouds so easily induced by the intense FCC-hh beams, which is also under consideration for the HL-LHC. Cooling the detector and accelerator magnets is another major challenge for a research infrastructure of this size, requiring huge cryogenic refrigeration capacity below 2 K. In collaboration with specialised industrial partners, significant studies of turbo compressors and also new mixtures of coolants have been carried out. A prototyping phase is to be launched after the completion of the forthcoming CDR. A collider that significantly extends the energy reach of the LHC requires multi-year and multinational cooperation, given the daunting magnitude of the resources needed. The high and growing number of young participants during the annual FCC meetings is a positive indicator for the future of the study. Moreover, the participation of a large number of industries in the FCC study and the supporting Horizon 2020 projects is not a surprise. After all, many of these challenges are also opportunities for technological breakthroughs, as confirmed by past large-scale scientific projects. The wealth of results presented during the FCC Week 2018 will help inform the update of the European Strategy for Particle Physics, written input for which is required by the end of the year (CERN Courier April 2018 p7). As CERN Director-General Fabiola Gianotti remarked during the opening session of the Amsterdam event, “I cannot see a more natural and better place than CERN to host future circular colliders of the complexity of the FCC, given CERN’s demonstrated expertise in building and operating high-energy accelerators, the existing powerful accelerator complex, and the available infrastructure that we continue to upgrade.” The laboratory’s long history and strong expertise in all the necessary technical domains, as well as its ability to foster international collaborations that amplify the impact of such large-scale projects, provide the ideal base from which to mount the post-LHC adventure. L’étude sur un futur collisionneur circulaire (FCC), lancée en 2014, imagine la construction au CERN d’un tunnel de 100 km de circonférence pour accueillir les collisionneurs qui succéderont au LHC. Ce projet international promet des mesures précises du boson de Higgs, et plus généralement une plongée dans un territoire entièrement inexploré, grâce à des collisions proton–proton à une énergie de 100 TeV. S’appuyant sur des propositions formulées en 2010 déjà, la R&D associée à l’étude FCC a progressé rapidement. Des scientifiques et des ingénieurs du monde entier se sont réunis à Amsterdam, du 9 au 13 avril, pour la semaine de la collaboration FCC 2018, afin de définir les objectifs clés pour le rapport préliminaire de conception sur le FCC, qui doit être présenté d’ici à la fin de cette année. A Blondel and F Zimmermann 2011 arXiv:1112.2518. J Gao 2017 Int. J. Mod. Phys. A 32 1746003. M Benedikt and F Zimmermann 2016 J. Korean Phys. Soc. 69 893. M Mangano (ed.) 2017 arXiv:1710.06353. M Bicer et al. 2014 J. High Energy Phys. 1 164. J Ellis et al. 1998 CERN-SL-98-004-AP ; CERN-EP-98-003 ; CERN-TH-98-033. T Sen and J Norem 2002 Phys. Rev. Spec. Top. Accel. Beams 5 031001. Frank Zimmermann and Michael Benedikt, CERN.